Stock Code HPB01 Certificate number 945, dated 21st December 148, for 35 shares of cumulative preferred stock of $6 each in this brick manufacturing company. The company was incorporated in 1857. Issued to Edward D Jones & Co, with the printed signatures of the company president and secretary. Ornate blue border with a vignette of two bears, together with an imprint of the company seal. Certificate size is 20 cm high x 29 cm wide. The founder of the Company, Mr. E. C. Sterling, developed the concept of molding dry clay with a hydraulic press. Mr. Sterling overcame many obstacles as earlier attempts to utilize a dry clay manufacturing technique in the East had proven unsuccessful. He established his first operation in Memphis. In 1864, after the disruption of the Civil War, he relocated to St. Louis. Once the superior quality of the dry press brick formed with the hydraulic press was demonstrated, it became necessary to move the first St. Louis plant from 18th and Chouteau to Grand and Chouteau. At this time, in 1868, Hydraulic Press Brick Company was incorporated. The dense brick formed under hydraulic pressure were heavier than the handmade brick in common use at the time. One of the great difficulties that had to be overcome was the reluctance of the hod carriers to handle the heavier brick. The significance of this weight factor was to play a great role in the later years of the Company as it became a pioneer in the early development and manufacture of lightweight aggregate. 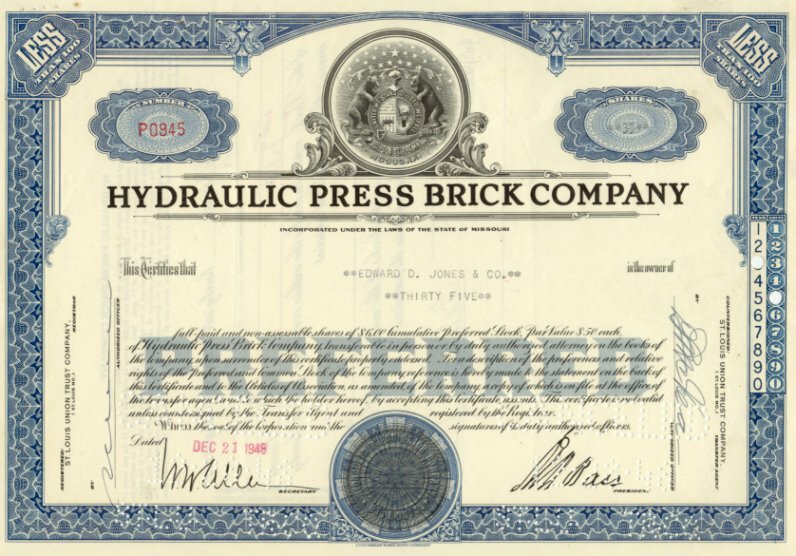 The success of the Hydraulic Press Brick Company brought about the establishment of many branch companies, usually started with local capital. Patent rights were granted by the Hydraulic Press Brick Company to the branch companies. In 1907, the branch companies, which extended from the East coast to Wisconsin, were all merged into the Hydraulic Press Brick Company. A few of the prominent early projects include the Eads Bridge, Anheuser Busch Brew House (built in 1891 and now a United States historical landmark), Willard Hotel (1901), Washington, D.C., and a number of prominent New York structures, such as the Chrysler Building, New York Hospital group, Equitable Life Assurance Building, Bank of Manhattan, and many others. Much of the early history of the Company was recorded by H. W. Eliot, the second president, serving from 1905 to 1908, and then as chairman of the board from 1909 to 1919. Mr. H. W. Eliot was the son of Reverend William Greenleaf Eliot, the founder of Washington University in St. Louis. He was also the father of T.S. Eliot, noted American author and poet. The company no longer manufactures brick but has retained their original name and specializes exclusively in the manufacture of lightweight aggregates. Hydraulic Press Brick Company with its headquarters in Indianapolis operates two manufacturing plants, located in Cleveland, Ohio and Brooklyn, Indiana.